From the Original Print Edition (from Fawcett Books): "A valued representative of Kauffman Real Estate and Auctioneering vanishes, and $100,000 in cash disappears from the company safe. But even more bizarre, old Friedrich Kauffman is receiving threatening notes--all skewered by antique hatpins that once belonged to his mother. To solve this baffling mystery, Kauffman's anxious daughter Elsa turns to computer-whiz P.I. Patricia Delaney for help. But Delaney's tell-all computer databases and personal snooping quickly uncover more than the respectable Kauffmans wish to reveal, including shady business practices, bitter sibling rivalries, and Friedrich's corpse, stabbed in the chest with a twelve-inch-long haptin shaped like an angel. It will not be the last." 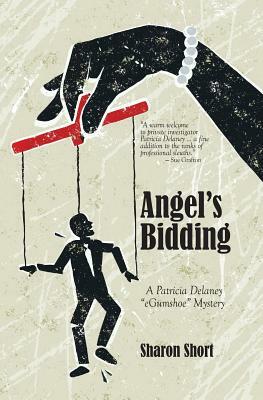 When Patricia Delaney debuted in 1994, she was a cutting-edge, first-of-her-kind "eGumshoe." Now, the reprinted editions (from Cornerstone Communications), with updates to reflect their times, of the Patricia Delaney eGumshoe mysteries still resonate with timeless humanity and passion, while providing a look back at the 1990s, when technology began to change forever how private investigators worked. Sharon Short is also the author of My One Square Inch of Alaska (Penguin Plume, 2013), in which a pair of siblings escape the strictures of the 1950s industrial Ohio town on the adventure of a lifetime. Opening chapters of this novel earned Sharon an Ohio Arts Council individual artist's grant and a Montgomery County (Ohio) Arts & Cultural District Literary Artist Fellowship. Sharon's book Sanity Check: A Collection of Columns includes 100 reader-favorites of her weekly humor and lifestyle column that ran in the Dayton Daily News from 2002-2012. Sharon has also published two mystery series (Josie Toadfern and Patricia Delaney) as well as short stories and essays. Additionally, Sharon is the Literary Life columnist for the Dayton Daily News, directs the renowned Antioch Writers' Workshop in Yellow Springs, Ohio, and is an adjunct instructor of creative writing and composition at Antioch University Midwest. Sharon holds a B.A. in English from Wright State University and an M.A. in English from Bowling Green State University. She lives in Ohio with her husband and is the mother of two college-age daughters.